Congratulations! You have graduated from college! But after the big celebration, you probably stopped and asked yourself: “Now what?”. Landing your dream job after college might be easier said than done. Even if you manage to get your hands on that position you craved after, making money on the side never sounds like a bad idea, does it? We live in a world where possibilities are endless. Everyone can find their secondary source of income. If you are wondering how you can make money after college, you came to the right place. All you need nowadays for making money is an Internet connection and your spare time. This is especially true for millennials since the Internet is like a second home. And the Internet can be a wonderful money-making place. There are countless ways in which you can turn your free time into dollar bills and we have a lot of ideas for you! Check out some of the best ways you can start making extra money even today! Let’s face it – we usually waste our free time by doing different things online, anything from playing games to watching videos of cute dogs wagging their tails. If we are already doing it, then why not do it wisely and get paid for it? For some, it might sound too good to be true, but it is actually completely legitimate. There are companies that will pay you to waste your time on the Internet! As good as it sounds, it’s true! Paid online surveys are becoming more and more popular and they are actually a very easy way to make money in your free time. You need to be careful though. Going for any website that claims that they will pay you for taking surveys might result in you ultimately and truly wasting your time. A good and reputable way of making money by taking surveys is Survey Junkie. Cash payments via PayPal and no spam! It costs nothing and while it might not make you a fortune, you will still be able to earn enough money to cover some of your expenses. Sign up to Survey Junkie and start earning when you are waiting for the bus or walking your dog! And there are more ways to make money online, not only by surveys. How many hours have you wasted playing games on your phone when you were bored? Now imagine if you can find a cure for your boredom and earn money! Swagbucks will give you $5 welcome bonus when you sign up using this link and pay you for playing games! Let’s just get one thing clear: Not any game you want. There is a selection of games they offer which are pretty entertaining and can be a perfect remedy for when you just don’t know what to do. Swagbucks also offer other ways that you can make money such as surveys, coupons and cash backs. Click here to see more ways of how you can make money by signing up to Swagbucks! …said the Joker and he was absolutely right. We are not talking here about situations like your grandma asking you to show her something on the computer because she knows you are good at it. But in all other instances where you can use your talent and strike a profit, don’t hesitate to do so. In fact, if you are good with computers as your grandma thinks, why not make money out of it? Were you successful assembling your own custom PC or managed to remove a nasty malware from your friend’s laptop? Helping the people in your surrounding can be a great way of getting some extra money without putting too much effort in. Plus, it is really pleasurable and confidence-boosting to be known as the smart kid on the block, isn’t it? You can ask around if someone needs help with tasks like mowing the lawn, walking the dog or looking after the kids. Being a freelancer is an incredibly rewarding thing. You are the master of your own destiny, or in this case, of your work. Freelancing can bring you big money if you are good at what you are doing and if you dedicate enough time. In fact, it is estimated that 36% of the entire U.S. workforce consists of freelancers. So if you are asking how to make money after college, this is your most obvious answer. If you are just starting being a freelancer, don’t expect to get top-notch rates immediately. You might be the best out there, but first, you need to get good reviews. Start off by offering your services at the lowest rate as you are willing to go and build a reputation for yourself. If you are good, soon enough you will be able to increase your rates and hang around in the pond where the big fish are. You can start making a steady income of several thousand dollars a month, or you can become like James Knight who makes $1000 an hour as a freelance programmer! If you have a good skill set, then don’t wait and dive into the world of freelancing. A good place to start is Fiver. Sign up to Fiverr today, showcase your skills and start making money as a freelancer! Still, if you are already working a full-time job after graduating from college, you might not have the time nor the will to take on more work as a freelancer. Luckily, there are other ways to make money after college and we will tell you all about them! The easiest way of having more money is by spending less money. And we don’t mean by refraining yourself from buying the things you want! Smart shopping is a term that became popular in recent years. For those of you who are not familiar with it, in simple terms, it means that you are on the lookout for the best deals and the best prices. You are investing a bit of time in finding deals, promotions, vouchers or discount codes in order to pay less for the item you need. In a sense, this is an earning method since you are investing time and keeping a percentage of the money you would’ve spent otherwise. Think of it like working for yourself and paying yourself a wage. This one is a no-brainer. It is about learning how to value your efforts more, don’t spend more than you need to and how to manage your money after college. And in this quest to spend less, the Internet is your best friend once again! But what if we tell you that you can? Why not sign up to cashback programs? `By signing up to Ibotta, you can get $10 welcome bonus and cash back for your purchases! Cash back programs like Ibotta are almost as good as free money. You are doing your shopping anyway, so why not get a percentage back? It is all free of charge – all you need to do is take a photo of your receipt! Working as your own boss within an already established company is a simple way of making money after college graduation. The beauty of it is that you do not need to have any previous experience. You just need the will to do it. Avon is one such company that offers the opportunity to earn money to everybody who is willing to grab it. In case you are not familiar with it, here’s how the model works: Every month you get their catalog of products. The more products you sell, the bigger the commission you get. On top of that, you will receive benefits and gifts and who doesn’t want free stuff! Become an Avon representative, be your own boss, improve your sales skills and earn money! In fact, a good Avon representative can even make a career out of it. It is up to you whether you will offer the products to the people you know or reach out to people online. The possibilities are endless if you put your work in it! If you have a free room that you use just to store stuff in, you are missing out on a good potential profit! A lot of people, especially young adults who are at college or just becoming financially independent are happy to live in shared houses. If you have that extra room, why not rent it out? Instead of filling it up with things that you will probably never use anyway, why not put a bit of effort in to make the room appealing and get yourself a new housemate? This is a brilliant way of how to make money after college since it is a passive income which requires little to no effort. Plus, you get to choose your tenant and you might have a great company while earning! If you are looking for more ways of making a passive income, click here and we will give you some inspiration! But you might not be looking to welcome someone in your home on a long-term basis. Then why not do short-term lets? Even if you don’t have an extra room in your home, you can still make money by renting it to people while you are away. Going away for the weekend? Spending a week at your parent’s house? Why leave your home empty when you can rent it out for a few days and earn more money? Sign up to AirBnB and earn money by renting your spare room or your home while you are away! This is one of the most logical ways of making money. Hotels are expensive, so if you live in a tourist destination you can make a fortune out of this! Looking to become an AirBnB host? We got you covered! Click here for our step-by-step AirBnB host guide! And You Can Do The Same With Your Car! Is your car sitting in your drive for days? Then why not rent it as well? By signing up to Turo, you can rent your car out on days which is convenient for you and earn money! It is a very simple process which can help you earn money after graduating from college. Just list your car, upload photos, select availability and respond to requests. Turo is covered by an insurance policy, so you don’t have to worry about potential damages. This is an easy way of making money on days when you don’t use your car. And for the days that you use the car, why not get the best deals on gas prices? Sign up to GetUpside and get up to 35% cash back when you fill your tank up! If only you could find a way of saving money, making money and having fun all at the same time. Well, there is, and it is called Long Game! Long Game works like a savings account. You deposit your money into your account that you can withdraw at any given moment – just like you would in your normal bank. However, the main difference is that Long Game rewards you for your deposit in coins. The more money you add to your savings account, the more coins you will receive. You can use those coins to play on their slot games with a chance to win! You can win up to $1 million, which automatically makes all normal banks boring! Install the Long Game app today and claim your 300 welcome coins now! 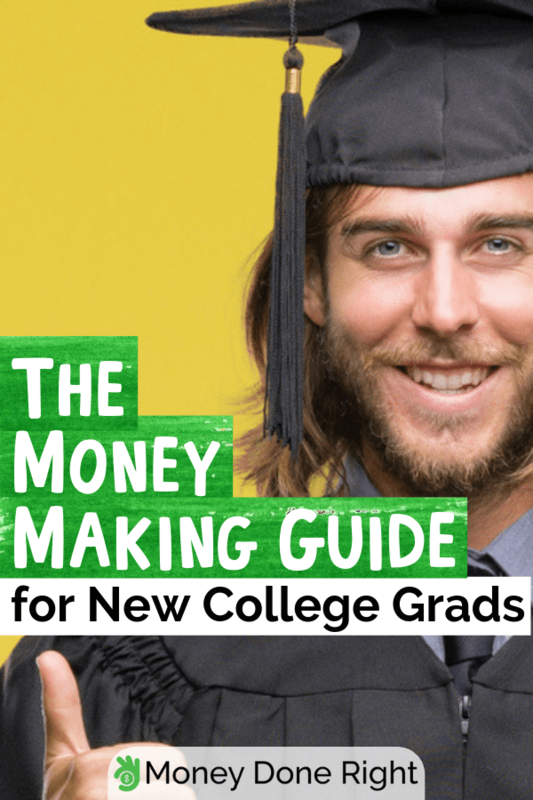 Finally, after telling you all the ways how you can make money after college, it is important to tell you that you also need to know how to manage your money after college. Back in the old days, you will need to write everything down yourself. Luckily, we live in a digital era where a dedicated software can do that for you! By using Personal Capital, you can track the balance on all of your accounts and your investments in real-time. It’s a simple way of being on top of your finances. Sign up to Personal Capital today and claim your $20 Amazon welcome voucher! If you utilize your time properly, you will always find a way of how to make money on the side. It is not rocket science, all it takes is a little time or effort. Calling all college graduates to use the opportunities in front of them and start earning today. Which of these earning methods are you most eager to try out? Can you think of any other ways of making money after graduation? If so, drop us a comment. We are always looking to expand our lists!